We needed a logo for WhirledView, something attractive, evocative and, above all, memorable. We considered the solar system, but the planets weren’t inspiring enough, so we expanded our scope. We thought of galaxies, those great swirling clusters of billions of stars that are mere smudges of brilliance against blackness to observers without a telescope. We’d be the telescopes, of course, scanning the vast info array that dances around us, connecting dots to make constellations of sense from apparent chaos. He suggested the NASA website among others that would have been obvious, if I were an astrophysicist, a cosmologist. “Piece of cake,” I thought, much too optimistically. Googling as directed, I drooled over the star-studded images that arrive courtesy of the Hubble space telescope, which NASA has condemned to a premature death. Reduced to blog size, unfortunately, these logo candidates had all the pizzaz of mud smeared on a picture window. Science, it seemed, was letting WhirledView down. But there are other sources for cosmology. I’d visited Bhutan in September and October, the month before we started WhirledView, filling flash card after flash card with digital photos. Presciently I’d taken several shots of an intriguing wall painting I encountered during a visit to the ancient dzong in Punakha. 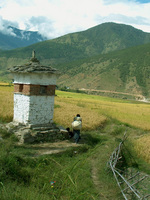 Punakha is an Eden of a valley toward the center of Bhutan. Thanks to its low altitude, about 4500 feet, it's stepped with rice paddies that were golden with ripening grain when I was there. 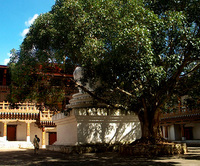 The subtropical climate explains why Punakha was the winter capital of Bhutan for 300 years, which in turn explains the elaboration of older structures into the existing impressive dzong. 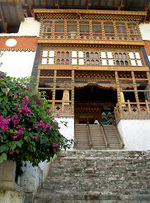 A dzong is a traditional administrative and monastic center. The one in Punakha, erected in 1637, stands at the confluence of the Pho and Mo rivers, an auspicious site traversed by Guru Rinpoche, also known as Padma Sambhava, when he brought Buddhism to Tibet and its neighbors in the eighth century. 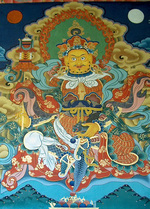 Dzongs are lavishly embellished with ornamental woodwork. Symbol-rich painting adorns most every surface. One eye-catching wall painting at Punakha had, for its central element, a cosmological design or mandala that suggested the solar system. Sadly for photographers lacking very very wide angle lenses, this huge painting faced a narrow porch fronting on a courtyard shaded by a sternly-pruned Boddhi tree with world-embracing ambitions. I perched on the railing, leaning back as far as I dared, camera in hand. I squatted in the courtyard below and aimed up. I tried to eliminate dark roof shadows. No matter how I positioned myself, I couldn’t capture the whole length and breadth of it in one bright, glorious shot. So I nibbled away at the painting, photographically, getting the mountains, the clouds, the sky, the vegetation, along with, always, a portion of that fascinating mandala. This was the painting I recalled, in a flash of delight and relief, while I sat staring glumly at the featureless reductions of space telescope images that had been so thrilling in larger sizes. I scrolled through my picture files and voila! The Punakha mandala, very slightly cropped, was indeed just what we needed for the WhirledView logo. Had I experienced mysterious intimations of a logo-needing-blog-to-be the day I put myself through such physical contortions to focus my camera? The psychic stuff, I mean. Of course not. I’m just interested in science. I raised scientist sons. And yet, what a wonderful coincidence! This shot of the logo-yielding painting at Punakha dzong shows the annoying railing, but, more important, it illustrates a highly cherished aspect of Bhutanese culture, the Tale of the Four Friends. Here’s the story: an elephant, a rabbit, a monkey and a goose planted a seed which grew into a towering tree laden with luscious fruit. Unfortunately not even the elephant, with his long trunk, could reach the fruit. But four is better than one, according to Bhutan's Buddhist-based folk culture. Like acrobats, the friends climbed one on top of the other, the bulkiest at the bottom, the lightest at the top. When the topmost succeeded in plucking a mouth-watering fruit, he immediately shared it with his friends. So all the friends ate well and were happy. Perhaps we should read this story to our own children and grandchildren. Now, we of WhirledView are three friends, not four, but we hope you are enjoying the fruit we select for your delectation. And here is one final painting from Punakha dzong. We'd like to think you savor our blog with a little serenity, a cup of tea perhaps, or a pleasant glass of wine at desk- or lapside. Though we aren't and never will be sages or gurus, we hope a little wisdom creeps in, off and on, in spite of ourselves.